In this episode, Matt Wallin, Mike Seymour and Jason Diamond discuss the latest Steven Spielberg film and retro fan hit: Ready Player One. Visual effects by ILM and Digital Domain. The film is set in the year 2045, when much of humanity, escaping the desolation of the real-world, uses the virtual reality software OASIS to engage in work and play. Wade Watts discovers clues to a hidden game within the program that promises the winner full ownership of the OASIS, and joins several allies to try to complete the game before indentured players working for a large company, run by Nolan Sorrento, can do so. Overall VFX supervisor: Roger Guyett. Note we will have a story on the film shortly here on fxguide. Special thanks to Matt Wallin, Ryan Pribyl and John Montgomery for producing, maintaining and editing the show. The podcast is only possible due to their great work and your support. ARTHUR:Yes, of course! 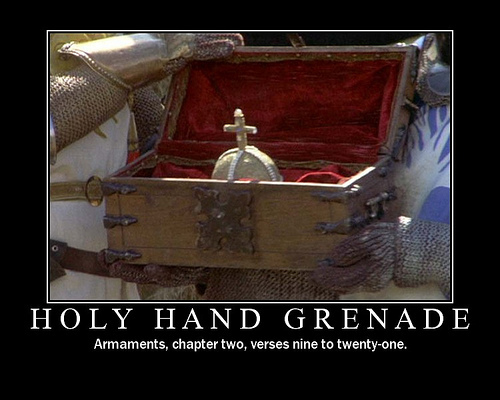 The Holy Hand Grenade of Antioch! 'Tis one of the sacred relics Brother Maynard carries with him. Brother Maynard! Bring up the Holy Hand Grenade! ARTHUR:How does it, um-- how does it work? ARTHUR:Consult the Book of Armaments!